قد يسبب السالبيوتامول رعشة خفيفة في العضلات الهيكلية (خاصة باليدين)، خفقان القلب وتقلصات بالعضلات. 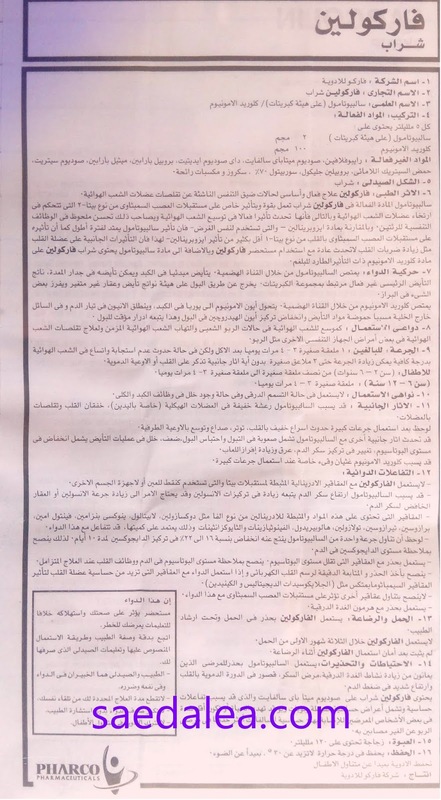 لوحظ بعد استعمال جرعات كبيرة حدوت اسراع خفيف بالقلب، توتر، صداع وتوسع بالأوعية الطرفية • قد تحدث اثار جانبية أخرى مع السالبيوتامول تشمل صعوبة في التبول واحتباس البول ، ضعف، خلل في عمليات التأيض يشمل انخفاض في مستوى البوتاسيوم، تغيير في تركيز سكر الدم، عرق وزيادة إفراز اللعاب. قد يسبب كلوريد الأمونيوم غثيان وقيء خاصة عند استعمال جرعات كبيرة . - لايستعمل الفاركولين مع العقاقير الأدرينالية المثبطة لمستقبلات بيتا والتي تستخدم كنقط للعين أو لاجهزة الجسم الأخرى. - العقاقير التي تحتوي على هذه المواد والمثبطة للادرينالين من نوع الفا مثل دوکسازولين، لابيتالول، ينوکسی بنزامين، فينتول امين، پرازوسین، تيرازوسین، تولازولين، هالوبيريدول، الفينوثيازينات والثايوكزانثينات وذلك يعتمد على كميتها، قد تتفاعل مع هذا الدواء . - ينصح بأخذ الحذر والمتابعة الدقيقة لرسم القلب الكهربائي وإذا استعمل الدواء مع العقاقير التي تزيد من حساسية عضلة القلب لتأثير العقاقير السيمبائومايمتكس مثل (الجلايكوسيدات الديجيتاليس و الكينيدين). - لا ينصح بتناول عقاقير أخرى تؤثر على مستقبلات العصب السمبثاوي مع هذا الدواء . إن هذا الدواء - يستعمل بحذر مع هرمون الغدة الدرقية. اتبع بدقة وصفة الطبيب وطريقة الاستعمال لم يثبت بعد امان استعمال الفاركولين أثناء الرضاعة ..
100 mg Inactive Ingredients : Riboflavin, Sodium metabisulphite, Disodium edetate, Propylparaben, Methylparaben, Sodium citrate, Anhydrous citric acid, Propylene glycol, Sorbitol 70 %, Sucrose & Flavour. 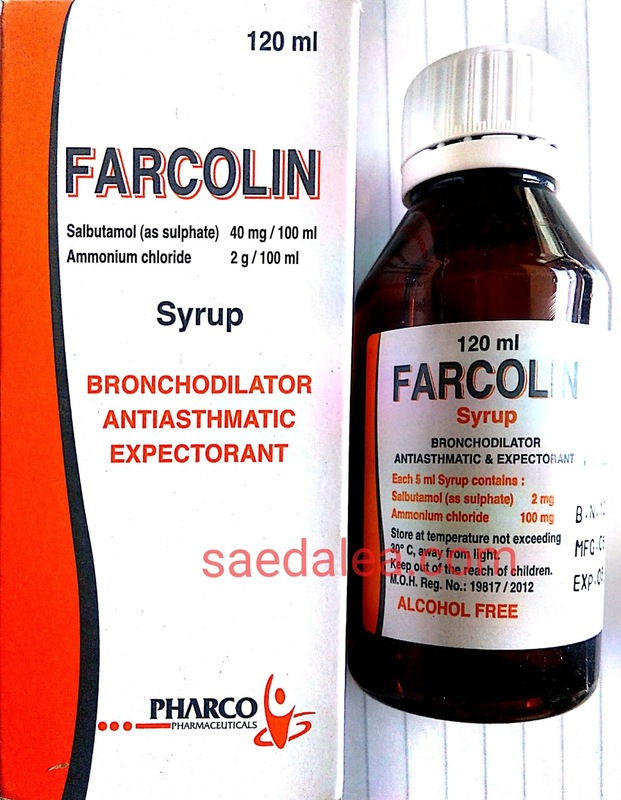 5) Pharmaceutical Form: Syrup 6) Pharmacological Actions : Farcolin is the mainstay of the symptomatic treatment of respiratory distress due to bronchospasm. Salbutamol, the active ingredient of Farcolin Syrup, induces a selective and potent beta2 - adrenergic stimulant action which causes the relaxation of bronchial smooth muscles. As a result, when given orally to a patients with asthma, Farcolin produces bronchodilatation, a decrease in airway resistance and a significant improvement in pulmonary function with the disappearance of dyspnea associated with bronchospasm , Salbutamol, as compared with isoprenaline, has the great advantage of exerting a pronounced and prolonged effect on bronchospasm. In addition, the results of clinical studies on Salbutamol proved that its undesirable effects on the beta1adrenergic receptors of the heart are much less (about 1/4 to 1/2) than that of isoprenaline. These illustrate how much the adverse cardiac effect, associated with the use of isoprenaline, are less likely to occur with Farcolin therapy. 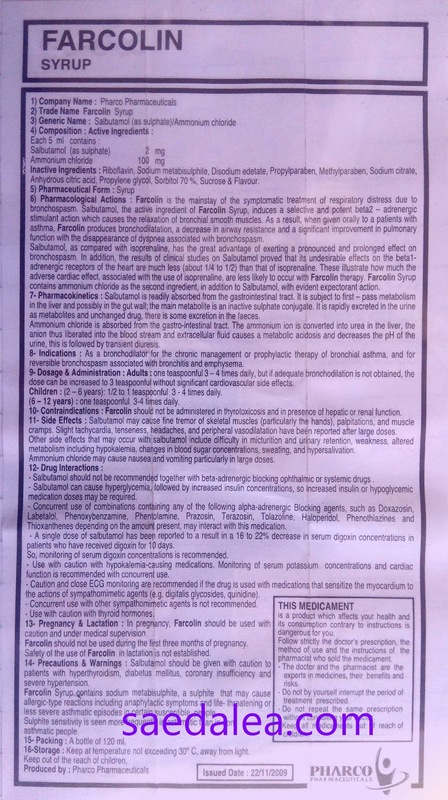 Farcolin Syrup contains ammonium chloride as the second ingredient, in addition to Salbutamol, with evident expectorant action. 7- Pharmacokinetics : Salbutamol is readily absorbed from the gastrointestinal tract. It is subject to first-pass metabolism in the liver and possibly in the gut wall; the main metabolite is an inactive sulphate conjugate. It is rapidly excreted in the urine as metabolites and unchanged drug, there is some excretion in the faeces. Ammonium chloride is absorbed from the gastro-intestinal tract. The ammonium ion is converted into urea in the liver, the anion thus liberated into the blood stream and extracellular fluid causes a metabolic acidosis and decreases the pH of the urine, this is followed by transient diuresis. 8- Indications : As a bronchodilator for the chronic management or prophylactic therapy of bronchial asthma, and for reversible bronchospasm associated with bronchitis and emphysema. 9- Dosage & Administration : Adults: one teaspoonful 3 - 4 times daily, but if adequate bronchodilation is not obtained, the dose can be increased to 3 teaspoonful without significant cardiovascular side effects. Children : (2-6 years): 1/2 to 1 teaspoonful 3 - 4 times daily. (6 - 12 years): one teaspoonful 3-4 times daily. 10- Contraindications : Farcolin should not be administered in thyrotoxicosis and in presence of hepatic or renal function. 11- Side Effects : Salbutamol may cause fine tremor of skeletal muscles (particularly the hands), palpitations, and muscle cramps. Slight tachycardia, tenseness, headaches, and peripheral vasodilatation have been reported after large doses. Other side effects that may occur with salbutamol include difficulty in micturition and urinary retention, weakness, altered metabolism including hypokalemia, changes in blood sugar concentrations, sweating, and hypersalivation. Ammonium chloride may cause nausea and vomiting particularly in large doses. 12- Drug Interactions : - Salbutamol should not be recommended together with beta-adrenergic blocking ophthalmic or systemic drugs - Salbutamol can cause hyperglycemia, followed by increased insulin concentrations, so increased insulin or hypoglycemic medication doses may be required. - Concurrent use of combinations containing any of the following alpha-adrenergic Blocking agents, such as Doxazosin, Labetaloi, Phenoxybenzamine, Phentolamine, Prazosin, Terazosin, Tolazoline, Haloperidol, Phenothiazines and Thioxanthenes depending on the amount present, may interact with this medication. - A single dose of salbutamol has been reported to a result in a 16 to 22% decrease in serum digoxin concentrations in patients who have received digoxin for 10 days. So, monitoring of serum digoxin concentrations is recommended. • Use with caution with hypokalemia-causing medications. Monitoring of serum potassium concentrations and cardiac function is recommended with concurrent use. - Caution and close ECG monitoring are recommended if the drug is used with medications that sensitize the myocardium to the actions of sympathomimetic agents (e.g. digitalis glycosides, quinidine). - Concurrent use with other sympathomimetic agents is not recommended. THIS MEDICAMENT - Use with caution with thyroid hormones. dangerous for you. Farcolin should not be used during the first three months of pregnancy. Follow strictly the doctor's prescription, the Safety of the use of Farcolin in lactation is not established. - The doctor and the pharmacist are the patients with hyperthyroidism, diabetus mellitus, coronary insufficiency and experts in medicines, their benefits and severe hypertension. risks. Farcolin Syrup contains sodium metabisulphite, a sulphite that may cause l . Do not by yourself interrupt the period of allergic-type reactions including anaphylactic symptoms and life-threatening or treatment prescrit less severe asthmatic episodes in certain susceptible people.